The realisation of academic freedom typically depends on controversy: it voices dissent. Linked to free speech, it is marked primarily by critique, speaking against – even offending against – prevailing or accepted norms. If it is to be heard, to make a substantial difference, such speech cannot be entirely divorced from rules or law. Yet legitimate rule – law – is itself established through talk, discussion and debate. Academic freedom seeks a new linguistic bond by engaging with or even producing a free assembly of mutually linked speakers. To curb such freedom, you delegitimise certain speakers or forms of speech; and the easiest way to do this is to isolate a speaker from an audience and to isolate members of an audience from each other. Silence the speaker; divide and rule the audience. When that seems extreme, work surreptitiously: attack not what is said but its potentially upsetting or offensive “tone”. Such inhibitions on speech increasingly chill conditions on campus. Academic freedom is typically enshrined in university statutes, a typical formulation being that “academic staff have freedom within the law to question and test received wisdom, and to put forward new ideas and controversial or unpopular opinions, without placing themselves in jeopardy of losing their jobs or privileges” – as the statutes of the University of Warwick, where I work, have it. Yet academic freedom is now being fundamentally weakened and qualified by legislation, with which universities must comply. British Prime Minister David Cameron, speaking in Munich on 5 February 2011, said: “We must stop these groups [terrorists] from reaching people in publicly funded institutions like universities.” This was followed by a UK government report on tackling extremism, released ahead of the recent election, which said: “Universities must take seriously their responsibility to deny extremist speakers a platform.” It was suggested that “Prevent co-ordinators” could “give universities access to the information they need to make informed decisions” about who they allowed to speak on campuses. Ahead of May’s UK election university events had already been changed or cancelled. And immediately after the election, the government signalled its intention to focus further on the extremism agenda. In endorsing this approach, university vice-chancellors have acquiesced in a too-intimate identification of the interests of the search for better argument with whatever is stated as government policy. The expectation is that academics will in turn give up the autonomy required to criticise that policy or those who now manage it on government’s behalf in our institutions. 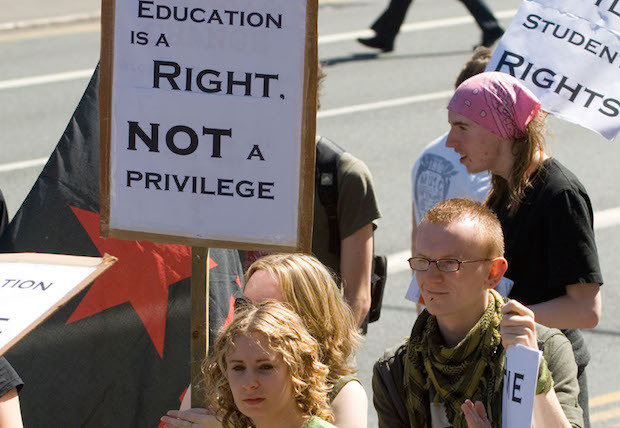 Summer 2015: Is academic freedom being eroded? Governments worldwide increasingly assert the legal power to curtail the free speech and freedom of assembly that is axiomatic to the existence of academic freedom. This endangers democracy itself, what John Stuart Mill called “governance by discussion”. The economist Amartya Sen, for example, has recently resigned from his position as chancellor of Nalanda University in India because of what he saw as “political interference in academic matters” whereby “academic governance in India remains … deeply vulnerable to the opinions of the ruling government”. (See our report from India in our academic freedom special issue.) This is notable because it is one extremely rare instance of a university leader taking a stand against government interference in the autonomous governance of universities, autonomy that is crucial to the exercise of speaking freely without jeopardy. Academic freedom, and the possibilities it offers for democratic assembly in society at large, now operates under the sign of terror. This has empowered governments to proscribe not just terrorist acts but also talk about terror; and governments have identified universities as a primary location for such talk. Clearly closing down a university would be a step too far; but just as effective is to inhibit its operation as the free assembly of dissenting voices. We have recently wit- nessed a tendency to quarantine individuals whose voices don’t comply with governance/ government norms. Psychology professor Ian Parker was suspended by Manchester Metropolitan University and isolated from his students in 2012, charged with “serious misconduct” for sending an email that questioned management. In 2014, I myself was suspended by the University of Warwick, barred from having any contact with colleagues and students, barred from campus, prevented from attending and speaking at a conference on E P Thompson, and more. Why? I was accused of undermining a colleague and asking critical questions of my superiors, the answers to which threatened their supposedly unquestionable authority. None of these charges were later upheld at a university tribunal. More insidious is the recourse to “courtesy” as a means of preventing some speech from enjoying legitimacy and an audience. Several UK institutions have recently issued “tone of voice” guidelines governing publications. The University of Manchester, for example, says that “tone of voice is the way we express our brand personality in writing”; Plymouth University argues that “by putting the message in the hands of the communicator, it establishes a democracy of words, and opens up new creative possibilities”. These statements should be read in conjunction with the advice given by employment lawyer David Browne, of SGH Martineau (a UK law firm with many university clients). In a blogpost written in July 2014, he argued that high-performing academics with “outspoken opinions”, might damage their university’s brand and in it made comparisons between having strong opinions and the behaviour of footballer Luis Suárez in biting another player during the 2014 World Cup. The blog was later updated to add that its critique only applied to opinions that “fall outside the lawful exercise of academic freedom or freedom of speech more widely”, according to the THES (formerly the Times Higher Education Supplement). Conformity to the brand is now also conformity to a specific tone of voice; and the tone in question is one of supine compliance with ideological norms. This is increasingly how controversial opinion is managed. If one speaks in a tone that stands out from the brand – if one is independent of government at all – then, by definition, one is in danger of bringing the branded university into disrepute. Worse, such criticism is treated as if it were akin to terrorism-by-voice. Nothing is more important now than the reassertion of academic freedom as a celebration of diversity of tone, and the attendant possibility of giving offence; otherwise, we become bland magnolia wallpaper blending in with whatever the vested interests in our institutions and our governments call truth. This vested interest – especially that of the privileged or those in power – now parades as victim, hurt by criticism, which it calls of- fensive disloyalty. What is at issue, however, is not courtesy; rather what is required of us is courtship. As in feudal times, we are legitimised through the patronage of the obsequium that is owed to the overlords in traditional societies. Academic freedom must reassert itself in the face of this. The real test is not whether we can all agree that some acts, like terrorism, are “barbaric” in their violence; rather, it is whether we can entertain and be hospitable to the voice of the foreigner, of she who thinks – and speaks – differently, and who, in that difference, offers the possibility of making a new audience, new knowledge and, indeed, a new and democratic society, governed by free discussion. Thomas Docherty is professor of English and of comparative literature at the University of Warwick in the UK.